EXPIRES 4/19 - Test Booster! Because Muscle Is Metal! Now Is The Time To Set A Fire And Light The Way To Gains! Now is the time to set a fire and light the way to gains. Escape the maze of mediocrity and let Metal Muscle consume your natural form, transforming your body into a testosterone driven powerhouse. This is the point in which you will no longer live in fear of plateaus and PR’s. 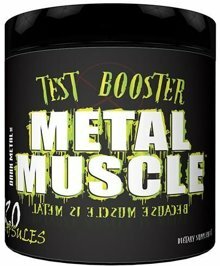 Derived from the thralls extensive ingredient knowledge, Dark Metal Inc is here to deliver you the ultimate muscle builder, Scientifically Dosed with D – Aspartic Acid and OxyGold.